Throughout the years, music, song, and poetry have been created to spread the message of peace, hope, and love. 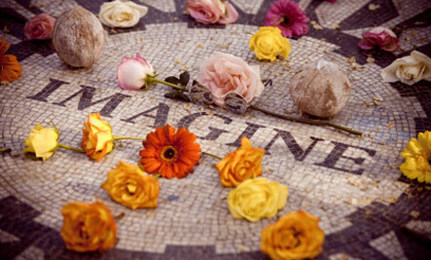 In honor of the International Day of Peace (September 21), we at Care2 have compiled 10 of our favorite songs about peace. Take a listen, and let us know if any of the 10 are amongst your faves. Or, let us know if you have a favorite that isn’t on the list – we’d love to check it out! Selected by: Samantha S. and Judi G. picked this for their favorite song about peace. We imagine it might one of your faves as well! Why: This is a lovely song that speaks of a world filled with love, hope and possibility…listening to either version makes me believe that peace is possible…and that we truly are living in a wonderful world. Why: I love the passion behind this song. Mayfield worked through tremendous challenges including an accident that left him paralyzed from the neck down. He continued to sing and record despite this setback. His conviction and dedication are very inspirational to me. Why: I love this song for its passion and authenticity, and I find it impossible not to sing along to, loudly. (Which has proven embarrassing when I’m listening to it on my iPod on the subway.) Great Motown trivia too: It was first recorded by The Temptations, but Motown didn’t want to release it as a single because they were afraid of alienating The Temptation’s more conservative fans. Edwin Starr volunteered to re-record it for release as a single: Starr’s version became a number-one hit on the Billboard Hot 100 chart in 1970, and it became one of the most popular protest songs ever recorded. Yay, Edwin. Why: Elvis Costello’s voice can have such a great tinge of yearning and desire–which I adore. His pleading voice mixed with the super obvious question of the song’s title and chorus just kills me. It’s so simple and poignant. Why: “We Want Peace” was released in 2003 around the same time of the U.S. invasion of Iraq. It was very meaningful at the time, especially since we were opposing the invasion here at Care2. Why: I like both the sound and message of this song and artist! Why: The lyrics and meaning are simple: wherever you are, if you’re with the ones you love, you’re home. And nothing is more peaceful than the feeling of “I’m home.” Plus it conjures of images of sunshine, waterfalls, pumpkin pie…. What are your favorite peace songs? Please tell us below!